I chuckled. I chortled. I guffawed. I giggled. I laughed. I howled. And then I chuckled again. Oh what great fun. Those British are so amusing: pip pip cheerio old chap. Do the British find this British film as funny as an American audience following through that accent? A group of 40-year-old men get together to re-enact a high school pub crawl: twelve pubs, twelve pints. What a premise. This is a veritable rite of passage for any man around the age of 18 and that unto itself is worth the price of admission. Ah, the things we guys do to ourselves to prove our masculinity. If you're a woman reading this, you are going to be shaking your head at how stupid we can be. If you're guy, you will have your own stories, er, tall tales, to recount about your own attempts at glory. Let's raise a glass to glory. But, let's up the ante. Let's jack up the humour factor by having 40-year-olds trying to do it. If guys in high school or college are a bunch of idiots; (supposedly) grown-up mature men doing it is just plain ridiculous. Edgar Wright, director and Simon Pegg, actor, have penned this hilarious ode to all that is masculine and juvenile as the third and final installment of the Three Flavours Cornetto trilogy. These gentlemen are close to batting a thousand. Their 2004 film Shaun of the Dead clocked in at 91% on Rotten Tomatoes and their 2007 opus Hot Fuzz was rated at 91%. And now they get 90%? Wait. How many people make three critically acclaimed films in a row? How many make three good films in their entire life? Let me warn you, however, by adding a spoiler alert here. A pub crawl is the premise but this tall tale also has robots and aliens. I won't go into details, but the authors have put together a very very funny story about older men finding their youth and facing the end of civilisation. Of course, drinking that much beer later on in life would seem like the end of life. It's funny to tell stories of talking with Uncle Ralph on the white telephone (throwing up in the toilet), but it isn't all that much fun to actually do it. But hey, add some robots and aliens and you've got an evening you will remember for the rest of your life... or till the end of civilisation, whichever comes first. It's grade 13 in high school and I'm sitting at a table with a few high school buddies hoisting a cold one. Three guys come in the door. Actually, two guys come in on either side of Rob who can no longer walk very well. It is Rob's birthday and the three musketeers are out to achieve the dubious goal of Rob downing a glass of beer (half pint) in a series of 26 establishments. I am sitting in pub number twenty-one. The trio sits down and I watch a couple of guys go over to chat as a waiter plops a single glass of beer on the table. Athos grabs the glass and hands it to Rob who keeps tilting wildly on his chair. I heard later that after Rob finished his 21st glass, he immediately proceeded to the parking lot to divest himself of his hops. Nevertheless, his inners cleared of all poisons, Rob went on to complete his odyssey of twenty-six pubs and twenty-six glasses of beer. I'm sure some will consider the hiccup after #21 as a disqualification but we must compliment him on his tenacity. It takes a man to get back up on a horse which has so unceremoniously thrown him (his stomach?) to the ground. Drinking. We men set up some pretty bizarre tests of masculinity, don't we? Pardon me while I beat my chest and howl at the moon. *cough cough* By the way, you may occasionally hear a bunch of older guys standing around sipping a cold one, and here I may mean Perrier, telling their inane juvenile stories and laughing. You will note that there is a lot of fun in the retelling but I have grave doubts any of them would actually want to relive any of it. Fun can grow in the telling not in the doing. Let's leave the pub crawling to the young and foolish. I enjoyed it. I laughed out loud. I would recommend it. And it has robots and aliens. See? Beer goes with anything. Woo-hoo! I'll try not to do a fist pump as I may spill the popcorn. And all this with a budget of twenty million? Holy cow. Who says you need to drop a couple of hundred million to come up with a good film? Get out there and have a good laugh. I will raise a glass and heartily say to you, "Cheers!" 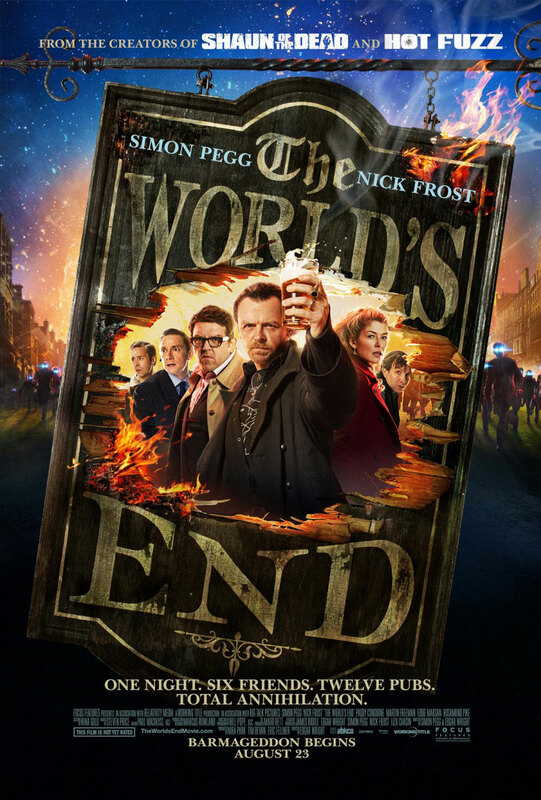 The World's End is a 2013 British science fiction comedy film directed by Edgar Wright, written by Wright and Simon Pegg, and starring Pegg, Nick Frost, Paddy Considine, Martin Freeman, and Eddie Marsan. It is the third in the Three Flavours Cornetto trilogy, following Shaun of the Dead (2004) and Hot Fuzz (2007). The film follows a group of friends who discover an alien invasion during an epic pub crawl in their hometown. Wright has described the film as "social science fiction" in the tradition of John Wyndham and Samuel Youd.